Rizk Casino was launched in 2016 and offers innovative, simple and fair online gaming. They have already been rated amongst one of the safest and most exciting online casino. The eye-catching theme is about a unique superhero universe led by Captain Rizk, who promises great rewards and loads of entertainment. 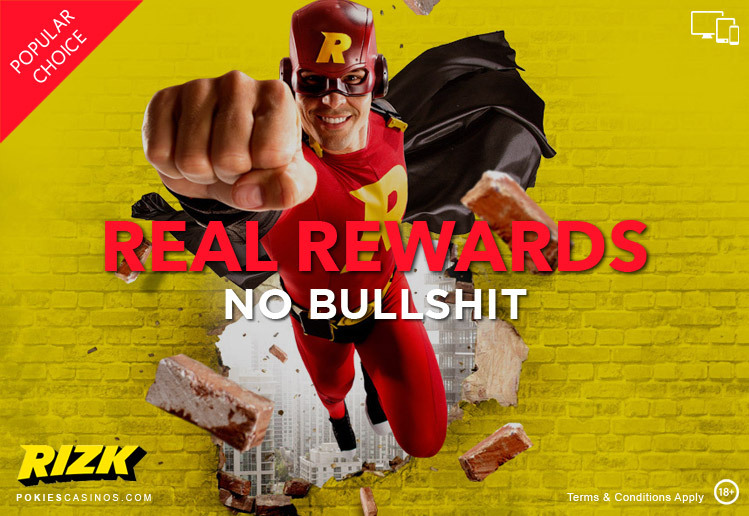 Rizk Casino also happens to be the architects of the Wheel of Rizk, which provides instant rewards, just for playing with no wagering requirements. Players get easy access to their favourite games and promotions, as well as various language and currency options. There is no need to download any special software, the games run smoothly directly in the browser. The games are mobile compatible on all Android and iOS devices. Rizk Casino offers over 400 games by leading software providers. The selection of exceptionally high quality games includes Pokies, Table Games, Video Poker, and Progressive Jackpots. The graphics are impressive with authentic sound effects. Rizk Casino customer support agents are available 24/7 to assist players. They can be reached easily via the live chat directly or by e-mail. Rizk Casino also uses modern SSL (Secure Socket Layer) data encryption algorithms which keep all user data, personal and banking private. They are operated by MT SecureTrade Limited, which is licensed and regulated by the Malta Gaming Authority and UK Gambling Commission. Players at Rizk Casino will enjoy the variety of pokies with thrilling themes and settings. The pokies include the latest titles by the various software providers. The games are neatly organized by category such as Provider, Action & Adventure, Hollywood, Horror, Jackpot, Live Casino, etc. Rizk Casino features some of the latest pokies such as Fairytale Legends, Midas Gold, Nordic Heroes, The Falcon Huntress, Wheel of Fortune, Vikings go Berserk. Rizk Casino also hosts a wide range of multi-hand variations of Video Poker games such as Aces and Faces, Deuces Wild, Jacks or Better, Tens or Better. There is also a selection of progressive jackpot pokies which include Mega Moolah, Hall of Gods, Mega Fortune, and Arabian Nights. Players can also enjoy authentic Table and Card games with many variations and wagering options. Most the games are available for free play, except the games featured in the Live Dealer Casino. The Table Games include all-time classics such as Blackjack, Baccarat, Roulette and Poker. Wheel of Rizk is a unique feature which is similar to the Wheel of Fortune. While playing your favourite games, the Rizk Power Bar will fill up. The more you bet the quicker the power bar fills, when completely full the Wheel of Rizk gets activated and ready to spin. Any game you play at Rizk casino helps fill up your Power Bar and they all lead up to the Wheel Of Rizk. Whenever the Power Bar fills up, you move up a level eventually reaching Jackpots and Super Wheels appearing on the higher levels. For every 10th level reached, the Super Wheel will be unlocked where the prizes get doubled. An extra spin of the Super Wheel on Level 5 will also be awarded. Level up to receive an Extra Wheel each day! It’s similar to the Wheel of Rizk; it’s won after your 1st level-up of the day and can be claimed the following day. Land on a Gold Coin to be rewarded with free money. The Jackpot symbol will only get activated from Level 10, all good things come to those who wait! When activating this Chip, the Rizk Power Bar will function twice as fast for a set period of time. This allows you to Level up twice as fast, getting twice as many spins on the Wheel of Rizk and winning more wager-free prizes. When the chip is activated, keep an eye on the countdown clock to ensuring you make use of every valuable second of the Double Speed Chip. The Red Chip is the 1st of 3 free spins chips which will award only a few free spins. This is the 2nd of the 3 free spins chips awarding free spins that are worth $1 per spin. The Blue Mega Spins chip is the 3rd of the 3 free spins chips awarding free spins worth $3 per spin. Simply click the Sign Up button and complete the registration form. Once registered, players can enjoy an authentic casino environment. Rizk Banking Options For e-Wallets, Credit Cards and Prepaid Cards. Once you have opened your Rizk casino account, you will need to deposit cash from your banking account into your casino account via any of the banking options on offer. AU Dollar, NZ Dollar, US Dollar, British Pound, Euro and payouts are processed within 2 hours. Description: Universal Monsters - The Phantom’s Curse is a 5 reel, 40 payline video pokie with a spellbinding love story where the Phantom falls for the beautiful soprano Christine. The animated sequences will unfold the plot from the backstage of the opera house and through the dark streets of France. The pokie features Wild Substitutions, Scatters, 3 Bonus Symbols that also act as Wilds, Free Spins, Pick and Click Bonus game plus Sticky Wild Re-spins! The bet lines pay both ways which increases the chances of winning.